Companies are discovering a few groovy team-building activities that ensure some serious fun. Google India’s 50-strong HR team was in for a surprise during their team building exercise at a resort in Coorg recently. Armed with percussion instruments, the corporate educator and his team were exhorting the Google team to take part in a samba performance. Initially taken aback, the Google band was swaying to samba beats in unison within a couple of hours. “It was serious fun. Intrinsically, for Google, work is both challenging and fun. It fitted perfectly into our work philosophy,” says Narasimha Prasad, People Programs Manager, Google India. Team Google’s idea of serious fun was one of the 15-odd short duration (2-4 hours) modules of Catalyst India’s innovative teambuilding programs. 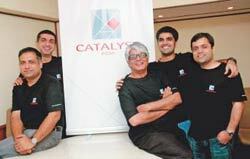 Catalyst India is an offshoot of the UK-based Catalyst Global, and it has been promoted by Exper Education in India. Exper is founded by Tarun Chandna and Gaurav Saklani (cofounders of iDiscoveri Education) and CEO Jayant Kripalani, renowned actor and theatre personality. Points out Prasad: “It was fun but there were key learnings as well. Unlike other training programmes, where the activities are exciting, but analysis leaves a lot to be desired, the Exper team analysed it brilliantly.” Team Google now swears by both Beatswork and Making the News (See Five Lessons Learnt). Here’s a snapshot of some of the Catalyst’s team-building activities. What’s “serious fun” for Google translates into breaking the silos for Hewlett-Packard (HP). In mid-June this year, a group of around 65 executives from the R&D arm of HP’s Systems Technology and Software Division (STSD) assembled at a luxury hotel in downtown Bangalore for an offsite, a term used to describe an official meeting outside a company’s office or campus. While most offsites are fairly dour affairs, involving day-long sessions of meetings and long-winded presentations, the team took an unusual path this time around, opting to use a bespoke teambuilding exercise to try and invigorate their exercise. The 2,000-person R&D unit had a good reason to take this offbeat route; a new General Manager and Vice President, Rick Steffens, had just taken over as the new head and he needed to get to know his employees and the different teams that operated in India. Adopting an unorthodox approach, HP employees were asked to design the front page of a newspaper to give their new boss insights into their business and the structure of their teams. “We had a non-Indian heading this business unit for the first time; we had to use this page to give Rick an understanding of the key message we wanted to convey to the organisation,” says Dinesh Sharma, Director, Business & Strategy and Operations, STSD, HP India. Over the course of the day, HP employees considered different facets of their business, covering the history of the business in India, its growth, strengths, weaknesses, challenges and also the opportunities for the unit. “We wanted to make the leadership transition as seamless as possible nd this technique helped us attain this goal,” says Sharma. Prior to this exercise, HP has also used Catalyst to hasten and improve decision making at other business units. “We found that decision making was restricted to independent silos and it had become hard to make disparate business groups collaborate on projects,” says Sharma. But, as a result of these initiatives, HP was able to break down these invisible walls and speed up the entire process. For their part, when 180 employees of Walt Disney Company (India) tapped their feet to samba beats in April, they were looking at the rhythm of their future. What helped them decipher that was another module: Making the News (See Five Lessons Learnt) that asked them to bring out the Disney growth story in India, five year hence. The employees were divided into groups and were asked to write a future newspaper about Disney India. Each group had its distinct version of what the future will hold for Disney. However, the story that unfolded through the eyes of the employees was that of technology, innovation and creativity. Says Subhasis Mishra, Head of HR, Walt Disney Company (India): “Be it making music as a group or creating a newspaper for the future, the modules got our teams thinking and together at the same time.” What’s unique about this approach is that “it brings in the unexpected and makes corporate messages simple and fun for all,” says Mishra. That’s exactly what the Qualcomm team discovered in early June. Little did Tyler C. Moore, Manager, Global Staffing, HR, expect that a game using blindfolds could end up building trust within his India team members, that pushing marbles down a tube could bring out the importance of team bonding while handling a process or that building blocks in a puzzle could let his team see the big picture compared to a focus on individual detailing. Not surprising, Moore, who has the India staffing team reporting to him, is visibly happy. By mid-day, he was not surprised when he and his eight other team members (from across the country) were informed of the next task on hand by Kripalani. The Qualcomm team was told that in the next two hours they would need to build a real boat from five big cardboard sheets and actually put it to use. The aids made available were only the cutting tools, pens and some drawings on how to build such a boat. Moore and his team at Qualcomm did better and put it together in just 90 minutes and as required, wrapped it in a plastic sheet and actually rowed it across a swimming pool. Boat-making, says Kripalani, was a task that had an element of fun but which simulated a real life work-under-pressure environment. People in the team had to debate, resolve conflicts and reach a resolution and in good time or the project would sink. 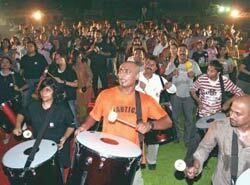 And if all that proves inadequate, you always have the samba to catch the rhythm of team-building.